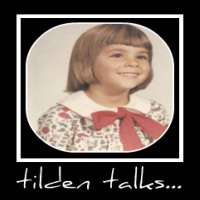 tilden talks...: I Can Dream Can't I? I may be laughing for the WRONG reasons... I would not be caught DEAD in that outfit. Well... the shirt is nice... lol. OMG! Her outfit is womens apparel. Yours is not. Plus she is NOT wearing sneakers. Or a T with stains. What's up with those shoes? Can you say ugly? I didn't even see the shoes. Isn't she just the cutest? Sometimes I wish I had those er' em knockers (ha) then I remember how much I love to run and ride my horse. NOT good girls!